Alan Richmond has been working at the Space Telescope European Coordinating Facility for three years. His area of responsibility was the development of a user interface to the European Science Data Archive for Space Telescope, and the integration of the system into the local data analysis facility. In his wor k Alan Richmond has demonstrated a very high level of professional skill. While this is not unusual per se, he is able to combine this with the ability to interact with the users of the software systems in such a manner that the result of his work meets their requirements in the best possible way. This allowed him to achieve an extremely high rate of productivity. In addition to the skills and abilities demonstrated by the results of his efforts, he is successful in maintaining a software engineering research activity. This has lead to his presenting papers at international conferences. 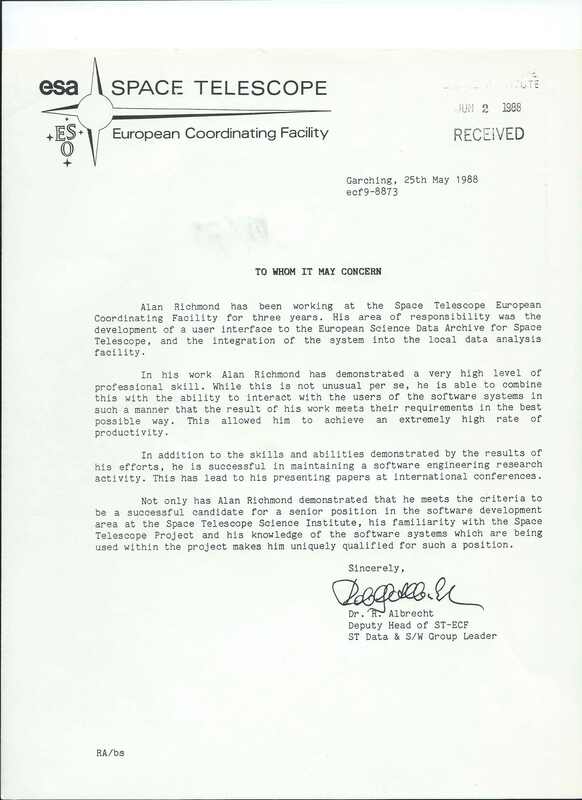 Not only has Alan Richmond demonstrated that he meets the criteria to be a successful candidate for a senior position in the software development area at the Space Telescope Science Institute, his familiarity with the Space Telescope Project and his knowledge of the software systems which are being used within the project makes him uniquely qualified for such a position.